This magnificent neo-baroque house at the corner of Anglická and Náměstí Míru is by the architect and designer Josef Pospíšil. 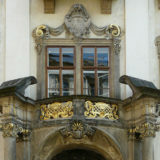 Although relatively little is known about him, Pospíšil left behind an enormous catalogue of Prague facades including those of the two neigbouring blocks at Náměstí Míru numbers 4 and 6. All three houses were constructed from 1902 to 1903, the result of his successful proposal for the redesign of this important square in Prague’s Vinohrady district. 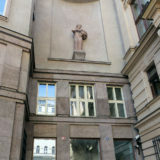 On the side of the building appears a more recent and sad addition: ‘Here lived from 1916 to 1925 Jan Štursa, Czech sculptor’. 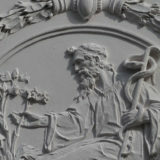 Štursa had served in the First World War, several battles from which he wonderfully memorialized on the facade of the Prague Legiobank. However, this brilliant artist remained deeply affected by the trauma of war and constant pain brought on by syphilis, and took his own life at the age of 44.